How can we use memory to construct a shared future view, leading to action? The next question is – whose memories do we hope to use? In Greetings from Hunts Point we hope to access and create shared memories of promises made to the community of Hunts Point. The results of which define many of the challenges in the community. By illustrating a present state defined by the past we hope to bring transparent the critical influence of the Greater New York City area on the small community of Hunts Point. It became clear to us as we spoke to people outside of Hunts Point that there was a lack of awareness and direct relationship with the area. Without a portal into the community, there had been few entry points into the conditions and circumstances of the area and its residents. 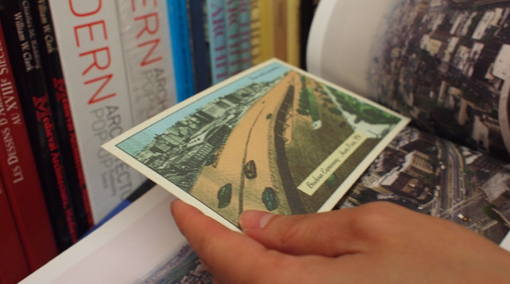 We chose to use post cards as a means to share the narrative of Hunts Point. These cards are designed to elicit feelings of intimate personal messages sent from a better place, a place worth noting and sharing. They are also meant to have a sense of longing for a different time. full of promises, now abandoned, like the cards, stuck away to be discovered. When choosing to bring attention to the challenges and issues within Hunts Point we were very aware that we could not be the voice of the community. We did not have the right, the permission or the authority to do so. We could not speak for the community, only of the community. We chose to use historical references in narrative and aesthetics to allow the story of Hunts Point to speak for itself, with us removed. We use present day statistics to narrate and make real striking issues in Hunts Point such as its 27% obesity rate, double the rate in New York City overall. We hope that future iterations of these cards will be created by the residents of Hunts Point, using the visual language of the community to raise awareness and provoke action. We hope to generate awareness and change through discovery, first of the cards in unexpected places, then of the story of Hunts Point, and finally of the first hand experience of Hunts Point. It is challenging to ‘speak for change’ without simply adding to the negative voices describing the circumstances. We chose to use statistics and tone of language to provoke curiosity and engagement. We use the leading statement “Wish you were here…” as an unexpected prompt to both consider the realities of the community and to become a pull into the community. Following this statement is a URL directing people to visit the online portal, a direct connection to events and organizations in the community. This portal is hosted on tumblr, allowing anyone to suggest and submit events and artifacts like videos, audio, and photographs. While this addressed the first part of our mission: to create awareness and bring people ‘into’ Hunts Point, it did not include a clear path to direct action by those in the community, for the community. To do this we used memory again, of the past, for the future. We chose to use the theme of the Worlds Fair to contrast with current conditions and to create an aspirational framework. Our second set of cards: “What I saw at the Hunts Point Worlds Fair 2025” use similar tactics as the first set, but for different end goals. In this case we hope to create a method for developing conversations around the future of Hunts Point, a structured open ‘space’ for dreaming and planning. The cards include provocative statistics and a prompt: “My vision for Hunts Point in 2025 is…”. This is followed by space to write or draw visions for the community. In the act of creating each vision, residents are given an open space to dream, a form of facilitated deep play. By sharing these in mass the community can develop a shared vision of the future and use these as prompts to create plans of action. Individually these can be mailed to influencers within and outside of the community, creating a method for channeling these thoughtful visions to others. The use of memory and constructed histories has helped us create provocations and moments of discovery and insight – it has not, in this form, managed to solve the dilemma of turning empathy and understanding into action. We rely, like many projects, on a combination of throwing a wide net to catch individuals and we utilize a facilitator for group activities. It is that moment from understanding to action that remains elusive. How do we trigger permanent change in behavior and transform world views? And then how to we know when we have succeeded? How do we measure success?